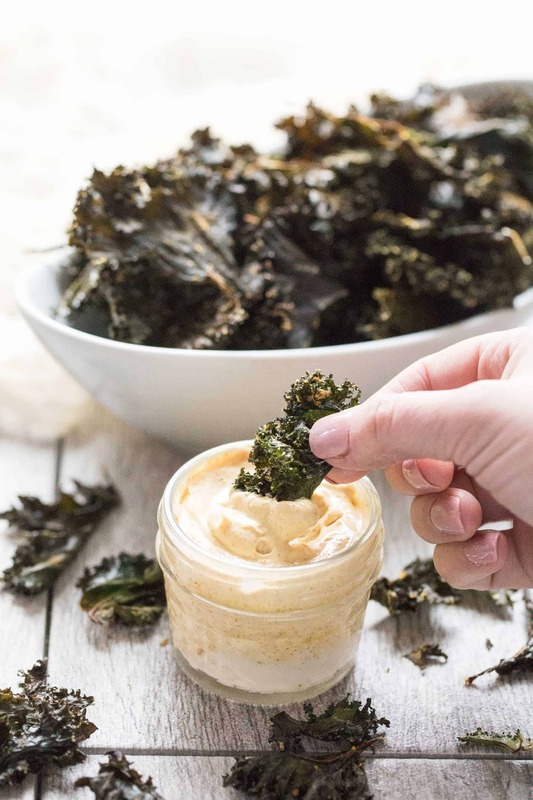 Roasted Kale Chips with Curry Aioli – a crispy, crunchy salty snack and appetizer that is Paleo & Whole30. Ready in 20 minutes. Served with a curry aioli dipping sauce. Gluten free, grain free, dairy free, sugar free, low carb, clean eating. One of the things I have the hardest times with during Whole30 is snacks. I love crunchy and salty snacks, and sometimes carrot sticks just aren’t going to cut it. Thanks goodness for Kale Chips! When you roast kale leaves, they get crispy just like a chip. 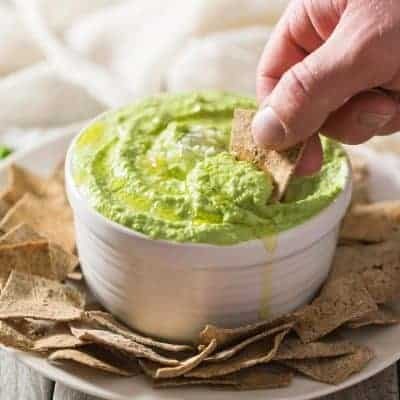 They’re crispy enough to use as a dip, and I love dipping them in my curry aioli. 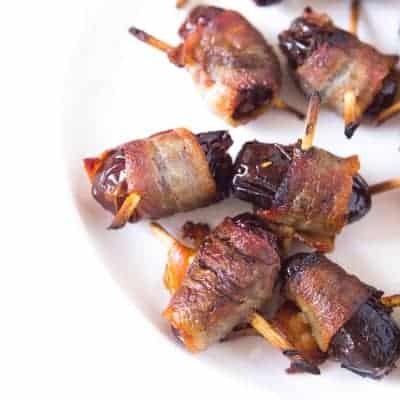 The salty and crunchy and savory is snack or appetizer heaven. I love kale chips so much, I grow my own kale plants in the winter so I always have plenty on hand. Kale is a very easy plant to grow, and the more you cut it the more it keeps growing. My favorite kale to use for kale chips is curly kale. I like the curly edges, it makes them perfect for dipping. But this works with dino kale too! 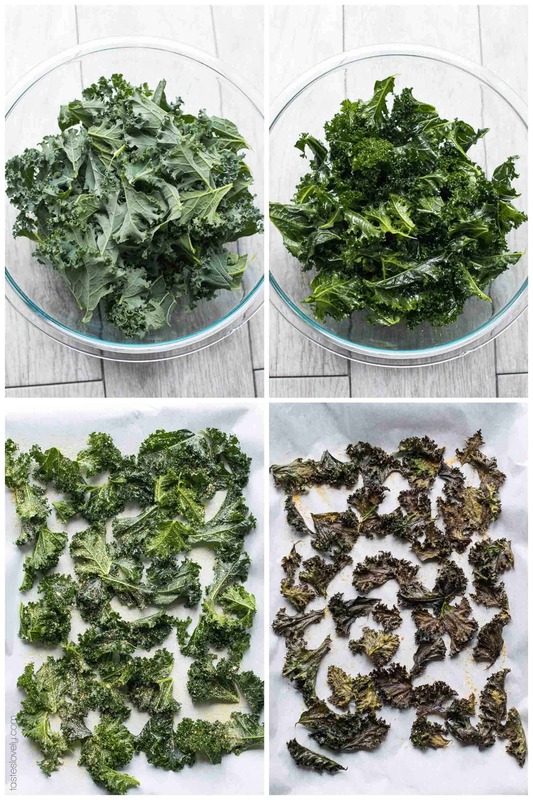 I don’t like the stems in my kale chips, so I remove the stems and hand tear the kale leaves into large 2″ chunks. About the size of a chip. I then massage them with olive oil so every nook and cranny of the kale leaf is coated in olive oil. My favorite seasoning is salt and a little nutritional yeast. 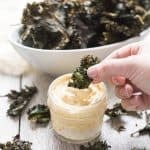 The nutritional yeast adds a little bit of a cheesy and savory flavor to the kale that makes them even more delicious. 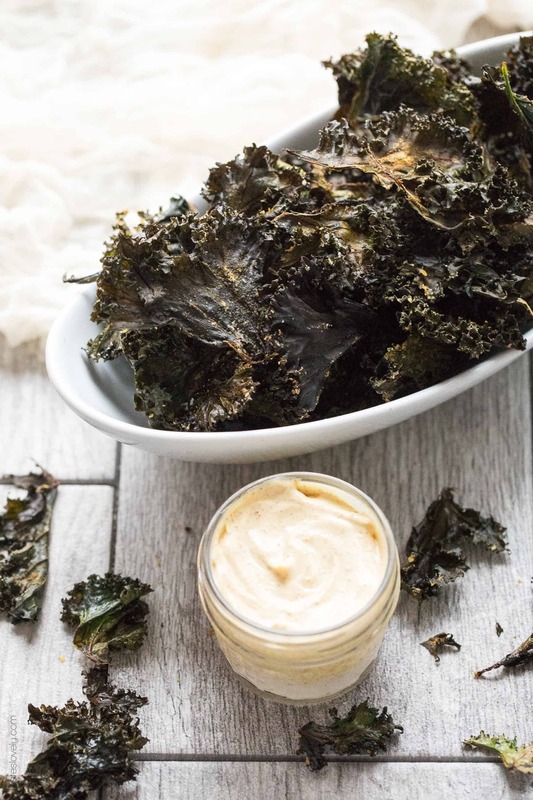 Not only are these kale chips delicious, but they’re so healthy! 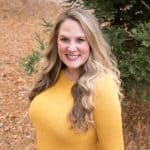 Paleo, whole30, gluten free, grain free, dairy free, soy free, sugar free, low carb. 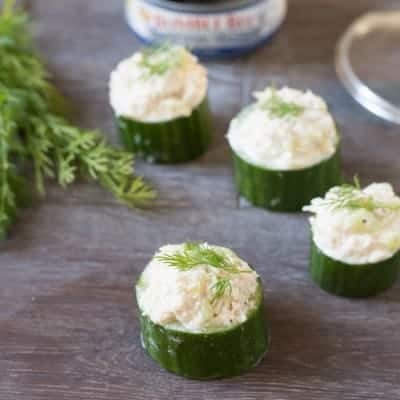 The perfect clean eating snack or appetizer. My 2 year old loves to eat them too! Preheat your oven to 300º with the oven rack in the upper and lower third. Line 2 rimmed baking sheets with parchment paper. Wash your kale leaves, and pat them dry. If needed, let them sit out on kitchen towels until completely, bone dry. By hand, gently tear the leaves away from the stem into large 1-2″ chunks. You want bigger pieces that are about the size of a chip if you can. In a large bowl, toss the kale pieces with the olive oil. Spread in an even layer on the baking sheets, then sprinkle with the salt and nutritional yeast. Bake for 15-20 minutes, rotating the baking sheets half way through baking. The kale chips are done with they are completely dry and if you bend them they crack. Remove from the oven and allow to cool. Stir to combine the mayonnaise and curry powder. 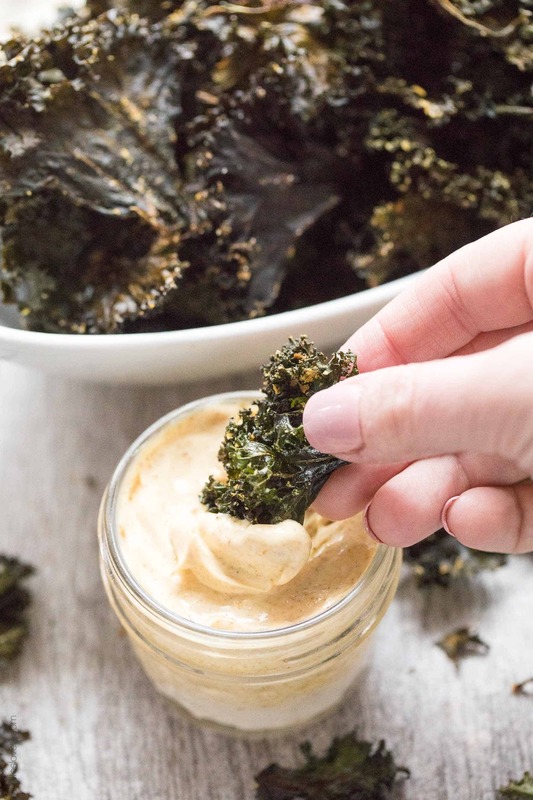 Serve the kale chips with the curry aioli. To store the kale chips, leave in an open bowl on the counter. You can cover them with a paper towel if you prefer, but I leave them out to the air. (If you put them in a ziploc bag they don’t stay crisp.) Eat within 2 days. Loved the dipping sauce! Really missed chips doing my Whol30. This is just what I needed. Thankks!